We call it the Outdoor Public Warning System. What do you call it? 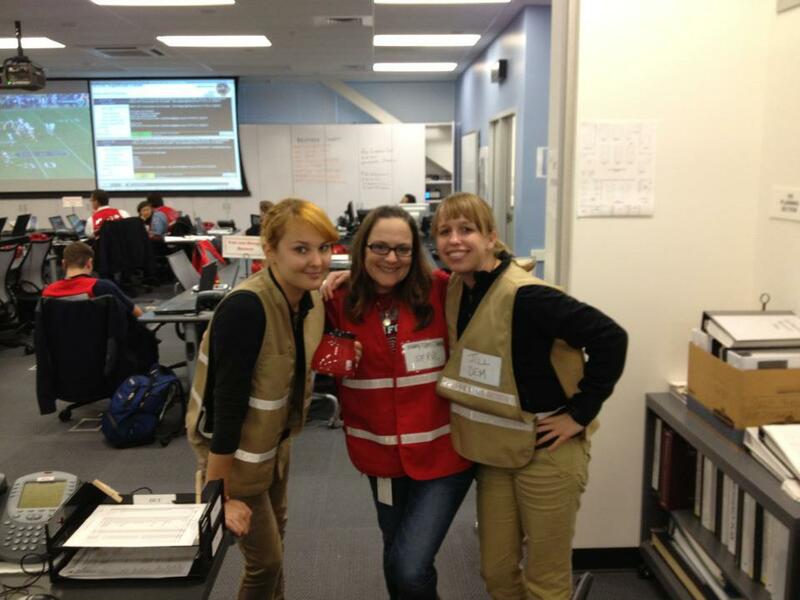 Today is Day 1 of San Francisco’s 3-day tsunami exercise and we’re practicing the City’s alert and warning procedures. Say what?!? It’s how we get the word out in an emergency- in this case a tsunami. For City leaders and top emergency officials, it’s reviewing the decisions needed to send an alert and even call for an evacuation of coastal neighborhoods. For the emergency operations center staff, it’s executing pre-planned measures to ready themselves and the public for an impending tsunami. While we won’t actually send alerts to the media, sound the sirens, push text messages, or dominate your Twitter feed- we will practice doing so in a simulated environment. 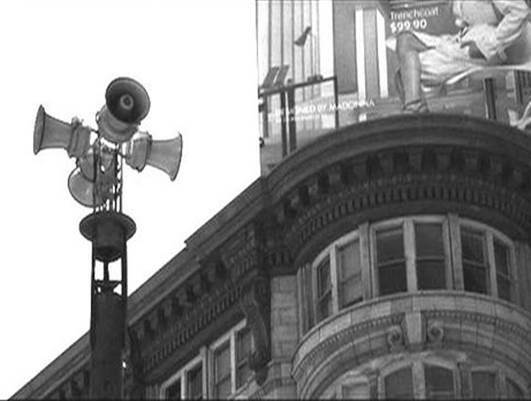 It has many names- the Burrito Call, the Tuesday Noon Siren, or Charlie Brown’s teacher but the San Francisco’s Outdoor Public Warning System is there to alert residents and visitors of the City about possible danger. Specific emergency announcements can be broadcast over any one (or more) of the 109 sirens which are located on poles and on top of buildings throughout all neighborhoods in San Francisco, Treasure Island, and Yerba Buena. SF72 moves beyond the concept of building a disaster kit — instead, it will provide accessible tools and simple steps to help San Franciscans connect with one another and support their communities, now and in the event of an emergency. The sirens, AlertSF, social media, WEA, and SF72 are just some of the resources we can use to help get the word out. In the event of tsunami or other major disaster, police, fire fighters, volunteers, and community networks could also help get information to neighborhoods throughout San Francisco. Finally, we’ll also push out information to the media so they can report what’s going on to you. 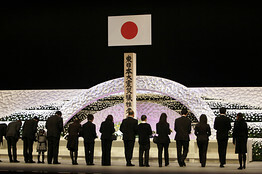 Photo from the Associated Press: Relatives of of the March 11, 2011 earthquake and tsunami victims offer chrysanthemums during the national memorial service to commemorate the second anniversary of the disaster on March 11 in Tokyo. Two years ago today the most powerful known earthquake ever to have hit Japan, and the fifth most powerful earthquake in the world since modern record-keeping began in 1900 occurred. The earthquake triggered a powerful tsunami, which reached the California coast. 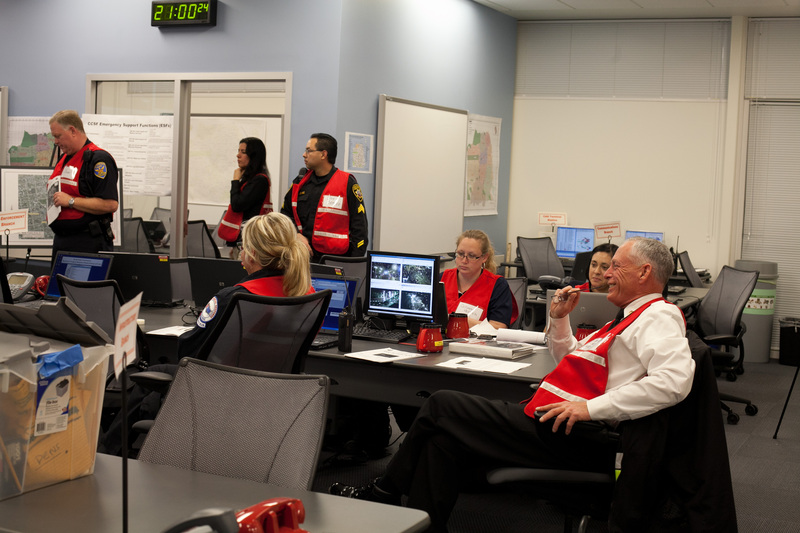 The tsunami resulted in a Tsunami Warning for San Francisco, and in response, the San Francisco Department of Emergency Management (DEM) partially activated our city’s Emergency Operations Center (EOC). Two years ago the EOC was buzzing with teams representing a variety of response agencies and organizations as we worked together to prepare for the waves reaching the shore. One activity of primary importance was making sure those who live and work in San Francisco knew about the tsunami warning and what to do. DEM used every tool in its tool chest to inform the public of the tsunami warning. These tools included social media (@sf_emergency and DEM’s Facebook page); traditional media with DEM Deputy Director Rob Dudgeon giving many interviews with the press, which aired on local news stations frequently through the day; and, we issued warnings and alerts on our text and email notification system, AlertSF. DEM urges anyone who lives and works in San Francisco and who has not yet registered for AlertSF, to commemorate this second anniversary of the Tohoku Earthquake and Tsunami, which posed an incontrovertible risk to San Francisco, by registering. This system is the most reliable of our tools as we cannot guarantee social networks won’t be overloaded and when/if the press will report through radio and television networks. As we look back two years ago today, we offer a DEM Blog from the archives commemorating the first year anniversary. As time always passes, for us at DEM the sentiment does not. All smiles (working in the EOC on Sunday night isn't so bad when you work with great people)! San Francisco has no shortage of things to celebrate—most recently being the 49ers NFC Championship Game. Although we were disappointed our team lost the game, we do not see this as a total loss. Why? Because when the masses in San Francisco celebrate, we have cause to activate the City and County of San Francisco’s Emergency Operations Center (EOC). And activate our EOC is what we did to support the various coordination needs that arise with big events such as an NFC Championship game. 2100 and still going strong! So, DEM treats celebratory events of city-wide significance as opportunities to test our skills, plans and procedures so when we activate for an emergency or disaster, we are practiced, focused and confident.